Mercy Ministries News: Unconditional Love on Mercy Multiplied This Sunday! Unconditional Love on Mercy Multiplied This Sunday! There is a lot of confusion out there about love, but the love of God is perfect and shows us how to live it out here on earth. The unconditional love of Christ will be the topic once again on our live radio show, Mercy Multiplied, this Sunday on SuperTalk 99.7. Last week, Mercy Ministries graduate Rachel Hardcastle and her husband, Jeffrey, joined Nancy in the studio and shared their story. Rachel came to Mercy a drug addict who had divorced her husband and lost her children, but through the unconditional love of Christ she was set free and her husband fell in love with her all over again. In a sweet moment of surprise, Rachel’s father called the show to talk about how miraculous her transformation was. Jeffrey’s mother also called in and spoke of how much she learned about true forgiveness and the unconditional love of Christ from her son in the way he forgave and loved Rachel. If you missed it, you can listen to the podcast HERE. This week, Nancy will be joined by another amazing graduate, Kathryne Coonce. Kathryne came to Mercy with an unplanned pregnancy. She chose life for her baby and in a selfless act of love, decided to place him for adoption. Kathryn now works for Mercy Ministries in the Intake Department, talking to young women who need the same help she herself once needed. You won’t want to miss hearing Kathryne and her husband, Jonathan, as they share their love story and make a special surprise announcement! 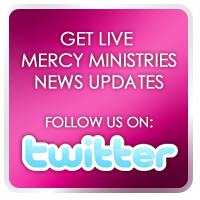 Tune in this Sunday from 9:00 AM - 10:00 AM CST or listen from anywhere in the country on www.mercymultiplied.com. Call us at 615-737-9986 to share your thoughts, questions and stories. St. Louis Celebrates Two More Lives Transformed! Mercy Graduates Excited to Pursue Their Dreams! Six More Graduates Restored and Free! Super Bowl Fun at Mercy Ministries!!! Power Packed Weekend With Nancy Alcorn!! !